If you want to setup a connection in USB OTG mode to a Windows host, configuration of the Pi Zero is basically the same. 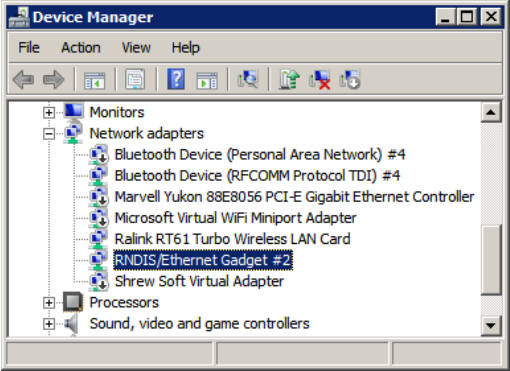 In the Windows Device Manager, your Pi Zero will show up as a RNDIS Ethernet Gadget. On the first time you connect, it may be necessary to install the proper driver. It must be manually installed and can be found among Network Adapters -> Microsoft Corporation -> Remote NDIS Compatible Device. If Bonjour is already installed on your system, will be known on your network as “raspberrypi.local”. Now you should be able to login using “Putty” with the credentials pi/raspberry. For enabling internet access on the Pi Zero, enable “Internet Connection Sharing” for the network device which connects your Windows machine to the internet. This can be achieved in the “Sharing” tab under “Properties” of your network device. Be aware that the IP address can be different on dual boot systems. Therefore, check your Pi Zero’s IP address with “ifconfig” again. Once your Pi Zero is configured, it is still possible to connect other hardware to the micro USB socket, given that you are using an external power supply. A WLAN dongle will be not affected by the settings above.